I was talking with a friend last week, and she basically asked if I was having a ton of outfit fun, now that I don't really have a formal dress-code anymore (also, hi Cait). Unfortunately, the answer was no. I had started to think about my fashion freedom but hadn't actually taken any action. I think some of that is an inability to get it together in the morning. The other day I spent 10 minutes hunting for a specific pair of pants I wanted to wear, couldn't find them, and blew through my getting dressed in the morning time (I did eventually find them, they had fallen off their hanger and were scrunched sadly behind my laundry bag). Cutting to the chase, starting tomorrow I am going to try planning my outfits, in advance, for the next few weeks. Like, written down in a notebook, planned (I was considering just putting them in notes in my phone but writing in a moleskin felt more romantic). I've been combing through my closet, have six upcoming outfits written down and I'm already excited: sequins, lace and color are all currently on the list. I'm hoping that I actually wear the outfits as planned (I tried to keep this week's upcoming rain in mind) and plan to do a weekly round-up here. 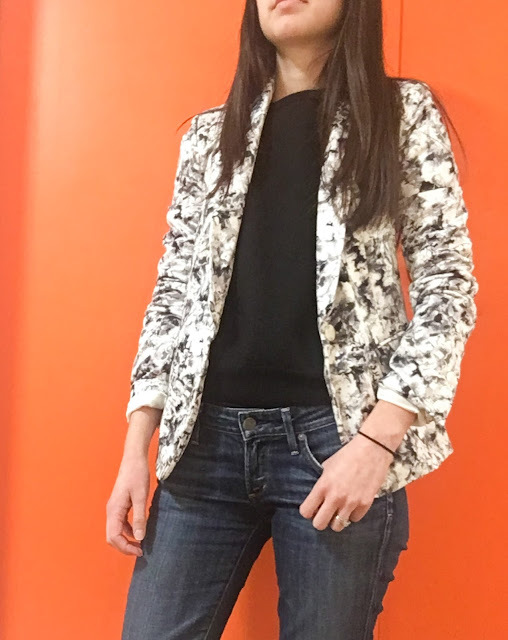 Although not yet one of these experimental outfits, I thought about it the very next day, when I grabbed a fun blazer and threw it on over the sweater and jeans I had already put on. By the way, this entire outfit (other than the shoes) is secondhand! The sweater, as I've mentioned before, was $5 from an after Christmas Goodwill sale, and the blazer was actually from the same after Christmas Goodwill sale, but from the year before. It was a whopping $6.50. I don't wear it a lot (the marbled pattern isn't really my current style) but even having only worn it about 5 times or so, I certainly think I got my money's worth. I've been thinking about planning my outfits as well. Now that I'm working on a closet inventory list (which will be up on the blog soon), I realise that some things hardly get any wear. Such a shame. I know it's because I'd rather stay in bed a little longer and grab one of my trusted 'uniforms' in a hurry. I need to get creative though, with the rest of the things that I own. I'm excited to see your post on how you inventoried your closet. I agree - I have so many things I'll see at the back of a drawer and can't believe I never think of them.